These days, with most of our time spent indoors, it can often prove difficult feeling connected to nature. We spend an inordinate volume of time at the office, at home, as well as countless hours travelling in between the two. Within the home the kitchen is undoubtedly one of the most commonly used spaces, and therefore, it can be advantageous to bring a little of the great outdoors 'indoors'. Whether your dwelling is located in a picturesque location or not, there are numerous ways you can inject some greenery and nature into your abode. Options such as French doors, picture windows, green walls, and even atrium ceilings are striking options that can hugely improve your most popular domestic area. To bring a little organic essence into your cooking space there are plenty of options and possibilities. Working with textures, tones, finishes, and accessories you will enhance this room, while the trick is to balance your internal area without overdoing it! Exploit any natural light you may have access to, and get creative wherever possible. For a few tips, tricks, and handy hints, check out the images below, and renovate your kitchen with a little outdoor inspiration today! The first example we are looking at today literally brings the sky into the home. We're talking about an atrium-style ceiling. Atrium ceilings are a roof/ceiling combination that is usually constructed using glass, acrylic, or another transparent material. Atrium ceilings can only be used if the room has direct access to the sky above, and therefore is usually prohibitive to those residing in apartments or condominiums. However, abodes that have access to the sky can greatly benefit from this ingenious and ultra-stylish domestic addition. 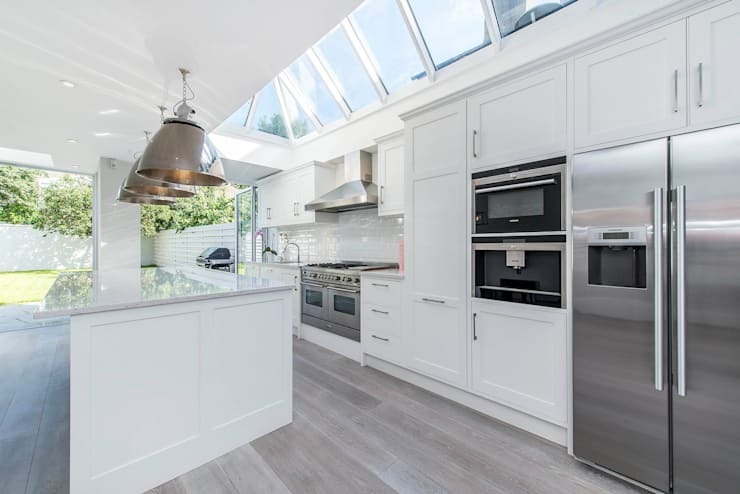 In this example we see a beautiful kitchen that brings the outdoors within the cooking space by employing a glazed ceiling. This not only looks wonderful, but contributes a huge volume of light to the internal space, providing a comfortable, and well illuminated room. Additionally, a set of bi-fold doors give full access to the compact courtyard beyond, and look fashionably chic. It sounds obvious, but many individuals forget the benefits of indoor plants. An instant ambience energiser, plants have the added advantage of purifying the air, and contributing a positive atmosphere to any dark or dull space. Better yet, many indoor plants require very little care, and look fantastic. If you are lacking space, you might want to think about a vertical green wall. Green walls come in many different shapes and sizes, offering an abundance of opportunities to increase the greenery in your home. 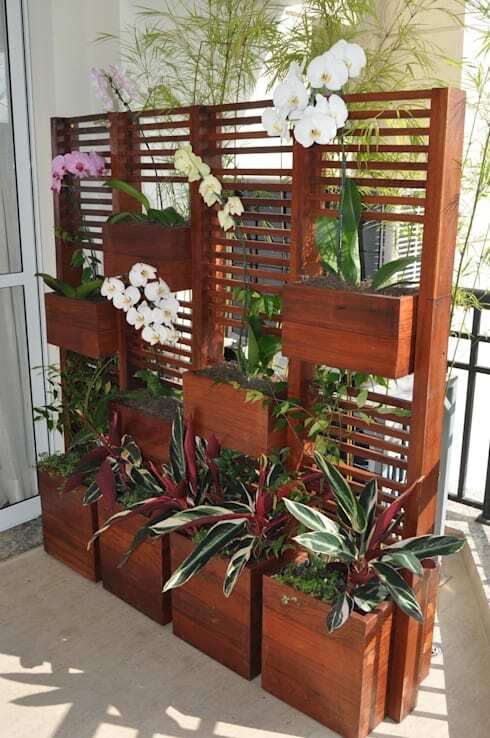 The example above is a stylish demonstration of a timber vertical planter. This would work wonders within a kitchen, offering the possibility of planting an easy-access herb garden for all your cooking needs. If your home overlooks mountains, woods, or lush wilderness you will definitely want to make the most to the scenery. And what is the best way to do this? Picture windows of course! Picture windows are essentially any large piece of glazing that maximises the view beyond, without the restriction of internal frames or any architectural feature that may impede one's line of sight. 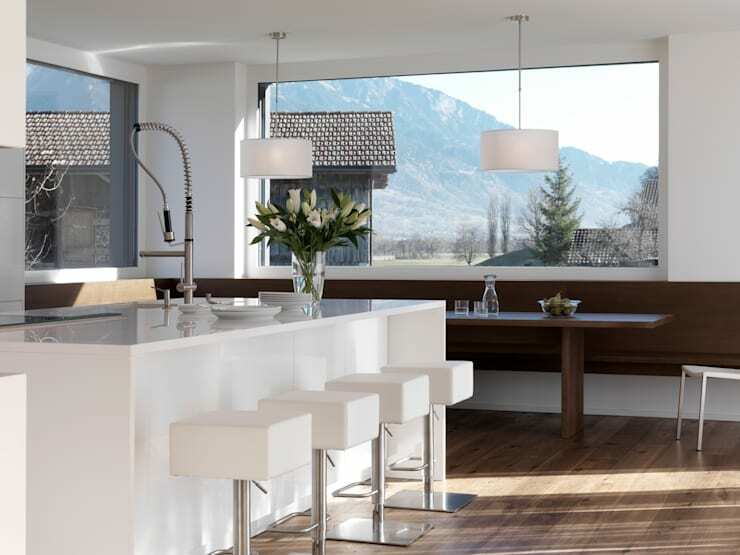 This illustration shows a beautiful kitchen overlooking a mountain range. Now, you may not have such a spectacular view to expose with a large window, but even a view out to a garden, park, or even a well-designed courtyard. Additionally, as the picture window provides such an illuminating image, the kitchen design itself is rather minimal. This avoids distraction, and keeps the attention focused on the landscape. French doors are a tried and tested home addition that can benefit your home in many ways. Not simply a set of doors to provide access to the garden, French doors are so much more! Effortlessly chic, boasting a classic style and design, these are the perfect way to let a little of the outside 'inside'. 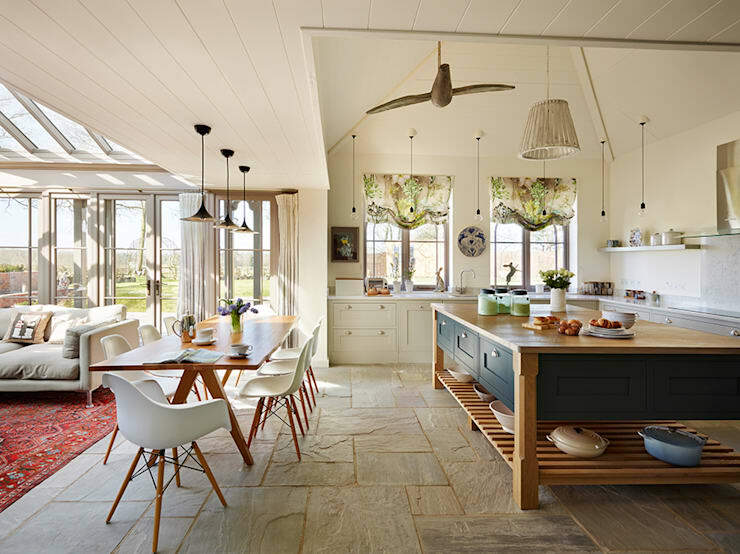 Here we glimpse a fabulous kitchen that has employed several different elements to bring the outdoors 'indoors'. The French doors provide easy access outside, while the twin windows offer stunning views of the countryside beyond. 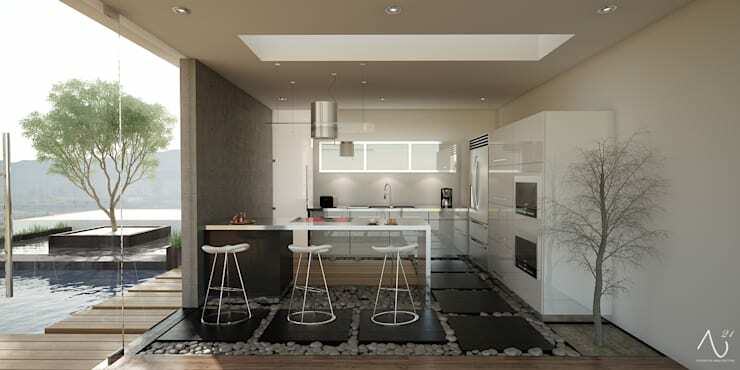 Another point to consider is the stylish use of natural materials in the construction of the kitchen. The island is a raw timber, while the stone flooring adds that extra feeling of connectedness with nature. If French doors aren't your cup of tea, or if you prefer something a little more modern then set your eyes upon this gorgeous example. Sliding glass doors are available in a range of different styles, designs, and can be custom made to virtually any size or configuration. Not only that, but they bring in a huge volume of natural light, enhancing the interior and ensuring the space's ambience is welcoming and enjoyable. This kitchen has it all! Replete with a huge central island that looks out into the garden, the space feels welcoming, and also at one with the exterior courtyard. 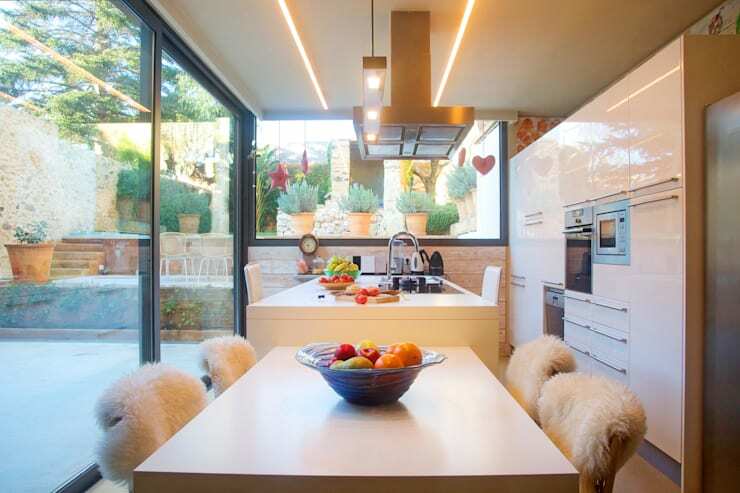 The glazing blurs the barrier between the outdoors and the interior domestic areas, ensuring the cooking space is well-lit, and gorgeously practical. As well as openings, doors, and windows, it is often a good idea to consider exactly where your kitchen is situated. Placement of a kitchen may seem secondary to any structural changes to your home, but in actuality, can be of the utmost importance. When choosing the situation of your kitchen, ensure it doesn't block any potential windows that could be used to add illumination and natural light to the space. Furthermore, consider a kitchen that creates a focal point towards a point of reference or interest, such as the one shown in the image above. If you are struggling to conceptualise your new kitchen design, chat to an interior designer or kitchen planner, and get the help you require to realise your dreams. Flooring is essential to the practicality and usability of your kitchen. It may not seem as though floors can help to bring nature inside, but they are in actual fact a brilliant way to evoke an organic aesthetic, and can drastically change the vibe and atmosphere of a space. 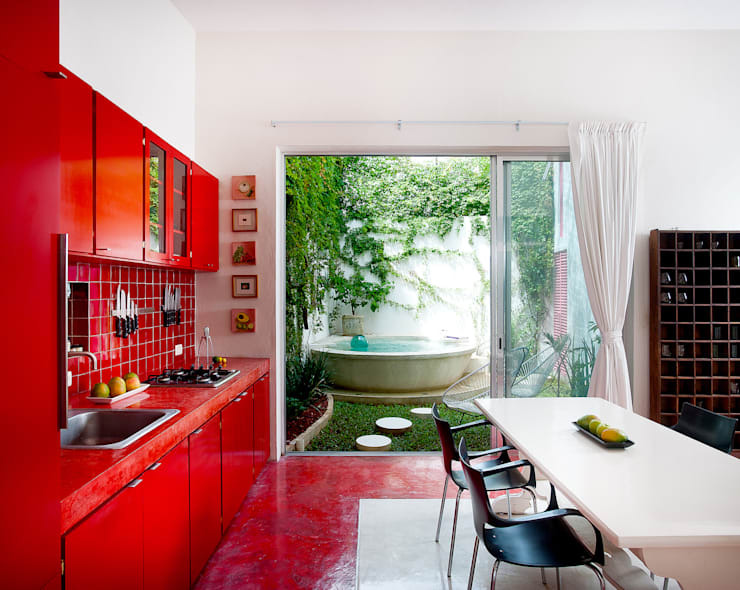 For an interesting take on kitchen flooring check out this example. The floor is a combination of large square tiles interspersed with pebbles. This Zen-like interpretation of regular flooring adds the sense of flowing water within the room, and is beautifully paired with timber floorboards. Finally, we have to start thinking outside the box. When you want to bring an essence of the outdoors 'indoors' it can be prudent to consider some ideas that might appear a little out of the ordinary. There exists an abundance of elements that can be worked with to bring this natural and organic feeling into your kitchen. Think items found in nature, colours, textures, accessories, plants, and finishes to infuse your kitchen with a sense of a beautiful natural environment. 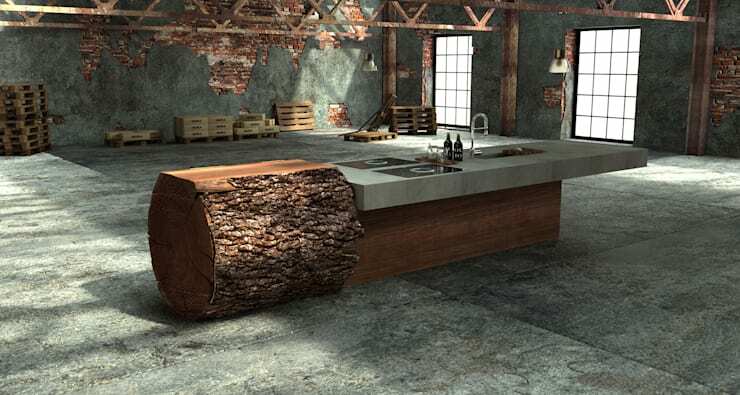 This example takes that mantra and idea to the next level with an incredible tree trunk countertop that looks unbelievably fabulous! Do you have some new and inspiring ideas for your kitchen renovation? If you need some more, check out another of our Ideabooks: Give your kitchen a rustic makeover! Do you have any other tips or handy hints for our homify community? We'd love to hear from you in the comments box below!